Constructed from a specially prepared, heavy denim fabric that incorporates elsatane for form-fitting comfort on and off the bike, the Charlie Denim Pant has a timeless American-vintage look, reminiscence of the iconic days of motorcycle riding. These regular/slim cut jeans are perfect for everyday use and incorporate CE?certified knee protectors that can be personalized to fit various leg sizes. 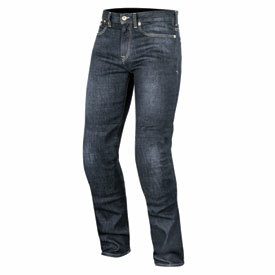 Heavy duty denim main material incorporates stretch elastane to improve riding comfort and all-round fit. Interior aramidic reinforcement in seat and knee areas offer excellent abrasion and tear resistance in impact critical areas. Internal knee compartment allows adjustment of its CE-certified knee protection to fit various leg lengths. Strong twin stitch main seam construction for added durability. Leather, vintage-authentic belt patch and coin pocket.